It’s 90 minutes nobody will ever get back. The GVR Board of Directors on Tuesday spent that much time on a proposed amendment to the Corporate Policy Manual that ended up going nowhere. The change — recommended by GVR attorney Wendy Ehrlich and the Board Affairs Committee — sought to address an issue that was determined not to be an issue. The committee recommended three changes to the CPM involving Life Care members — people who once lived in GVR properties but who have moved to senior living facilities and took their membership with them. Two of the three changes were not a problem: Life Care users may not serve on the Board of Directors or be a member of a Committee of the Board. The third was the hang-up. It would have deleted language that said Life Care Users could purchase guest card passes just like any other GVR member. Ehrlich and the Board Affairs committee recommended killing the language even though it exists in several other places in the policy. In short, changing it wouldn’t change anything. Read the entire Green Valley News article here. Originally published on June 26, 2018. Pima County is looking at Plan B in anticipation that a half-cent sales tax to fix roads will be voted down at Tuesday’s Board of Supervisors meeting. The board will vote whether to implement the tax when it finalizes the county budget. Any tax increase needs a unanimous vote, and District 1 Supervisor Ally Miller has publicly said she would not back a tax hike for road repairs. Supervisor Steve Christy voted against an ordinance — a precursor to approving the tax — last month because it would allow $3 million in general fund money to go toward social service programs. He said Friday that he also will vote no on the sales tax on Tuesday. If the vote fails, as expected, the board could ask voters to authorize a bond initiative on the November ballot, according to a June 14 memo from County Administrator Chuck Huckelberry. The memo presents two proposals: a $430 million bond that would be repaid in 10 years (including paying down current county debt), or an $860 million package that would take 15 years to pay back. Read the entire Green Valley News article here. Originally published June 15, 2018. Public comments have quieted since the board returned from lunch. #PimaCounty will finalize its $1.3 billion budget for FY 2018/19 by the day's close. Check out @greenvalleynews's coverage online and on newsstands today and tomorrow. Cheers! Paul Stapleton-Smith also asked the board to 'take all steps necessary' to stop collaboration with #ICE. Now four speakers have asked that U.S. Immigration and Customs Enforcement (#ICE) officers be removed from #PimaCounty jails. David Eppihimer thanked Supervisor Ally Miller, District 1, and Supervisor Steve Christy, District 4, for their anticipated ‘no’ vote on a 10-year tax hike that would repair #PimaCounty roads. Eppihimer is chairman for the Pima County #Republican Party. Wendell Long said repairing roads is one key issue this community can fix. #PimaCounty roads are of great concern for residents and business owners alike. He also said it was an honor to serve as chair of the Pima County Sales Tax Advisory Committee. Call to the public. A #tax poem is next up at the #PimaCounty Board of Supervisors meeting. Nearly 100 people packed American Legion Post 66 in Sahuarita on Thursday to hear two of the four candidates running for the GOP nomination in Congressional District 2. Brandon Martin of Sierra Vista and Danny “DJ” Morales of Douglas agreed in principle on every issue, from immigration to the national debt, but offered different approaches to address them. Candidates Casey Welch and Lea Marquez Peterson did not attend Thursday’s event, sponsored by the Republican Club of Green Valley/Sahuarita, and moderated by Green Valley News/Sahuarita Sun editor Dan Shearer. The seat is currently held by Rep. Martha McSally, who is running for the Senate. Martin said his top priorities are border security, national security and federal government overreach, specifically as it relates to the national debt. He championed President Donald Trump’s efforts to curb regulations and place American interests first. “Now we’re under attack from the left,” he said. Morales said his experience in local and regional politics gives him a leg up, as does being born and raised in the district. “I look forward to representing you, fighting for you, because you are my family,” Morales said. He was elected to the Douglas City Council in March 2016; six months later he was appointed vice mayor. He resigned in February to focus on the congressional race. He said he’s ready for Washington and looks forward to fighting for local interests, limiting government and promoting free and fair trade. Read the entire Green Valley News article here. Originally published on June 7, 2018. As the midterm elections loom, local Republican and Democratic headquarters are hosting guest lectures, helping candidates strategize and fielding walk-in questions about state and national politics. Both groups are expecting foot traffic to slow during the summer. However, by mid-August the clubs will be in full swing, especially following the primary election Aug. 28. 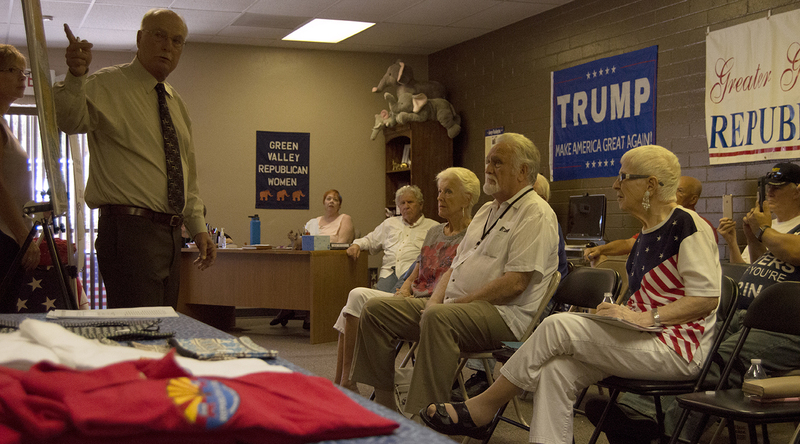 Here’s a snapshot of the goings on at the Republican Club of Green Valley/Sahuarita and the Democratic Club of the Santa Rita Area. Robert “Bobby” Wilson pitches his proposal for eliminating property taxes to a small but engaged crowd at the Republican Club of Green Valley/Sahuarita. He’s been here before, and he’ll return a handful of times before the midterm elections are over. The weekly Brown Bag Luncheon attracts 11 people, this week, two of whom capture video clips with their cell phones. Wilson is running for state Senate in Legislative District 2 against incumbent Democrat Andrea Dalessandro. He anticipates the campaign trail will be arduous, but assured the audience he’s been through worse. “Bring it on,” he told them. Throughout the year, the Democratic Club of the Santa Rita Area works with political groups, hosting guest speakers and helping candidates vying for office. They don’t do it alone. 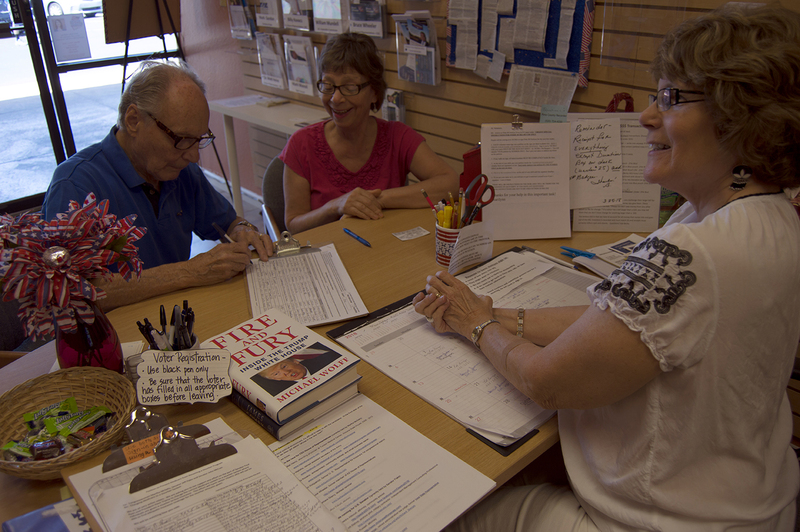 Club president Dean Chaussee says partners include the Pima County Democratic Party based in Tucson; alliance4action, a local activist group focused on progressive issues; the Democratic Club of Quail Creek, a discussion group, charitable organization and political canvassing proponent for Democratic candidates; and the Santa Cruz Democratic Party. “We’ve been trying to work closely with these groups, so when we bring speakers in, Democratic speakers, everybody gets a chance to see and hear them,” Chaussee says. Read the entire Green Valley News article here. Originally published on May 30, 2018.